Born in 1832 in the island of Uto, Finnish Otto W. Lindholm´s life was always full of adventure. He travelled the world several times, and gained an excellent reputation in the most exclusive aristocratic circles of the Imperial Russia. The recollection of his amazing journeys has been not lost thanks to his great grandsons, Alexander C. de Haes-Tyrtoff and Nicholas Tyrtoff Davis, the editors of the current book who dedicated 4 years of effort to the publication of Lindholm´s memories. A unique life of a unique Finnish man that you should not miss! After reading the memories of Lindholm´s life, I was certainly impressed with his achievements. His life was not easy, but we are facing a man who is able to endeavour the most impossible tasks with a decision made of steel. The young Otto had certainly to grow fast, losing his father at the age of twelve and enlisting on a whaler to sail around the world. He is the ultimate definition of resolution, a man shaped by the experience and the will to improve and escalate in the social circles. 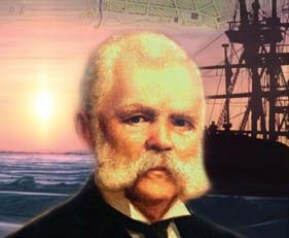 Nicholas Davis, one of the editors of the book, defines perfectly the image that could remain of Lindholm after following his wanderings around the globe: “The picture that remains in my mind is that of being a captain of a whaling ship in 1859 at the age of 27 years and shows what he was capable of for the rest of his life; the courage to confront unknown dangers and to take responsibilities in dangerous situations; his strongest points are to learn and to know in detail everything that was new – the how and the why (steam-engines, gold mining, surveying, constructions, etc.). His weak points: like every human being he must have had weaknesses but they really don’t appear in his writings. He certainly was stubborn. Lindholm was an educated man who put a great interest in finishing his studies with the best grades. But you can notice throughout the book that maybe his biggest moments of pleasure are when he is in full contact with the nature, trying to find his way in the middle of isolated landscape in North Russia or pursuing a whale in the vast ocean. Nevertheless, coming from a relatively humble family, you cannot miss that he really finds pleasure in collecting meticulously every new friend from the high aristocracy that he meets and the honours that provided to him. 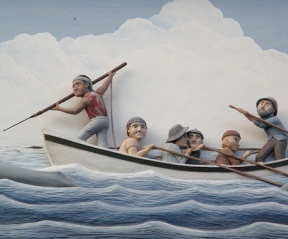 Although born in what is today the territory of Finland, the references to the country happen just from time to time, when the young Otto comes to Helsinki to finish his studies after his first experiences in a whaler, or years later when he comes back renting the best carriage of the city. But the Finnish capital was never one of his favourite ones, although he had a good time with old friends there, always considering it in a way inferior to many other cities that he had visited around the world in that time. It is also very curious to see his trips through the United States or Japan, and how he was able to foresee many changes that would happen years later. Lindholm seems to have had a distinctive good sense for making business as far as analyzing situations and people in every particular situation, and that led him to be a successful captain and later business man. Although he was a tough man and did not hesitate to use the force if needed, you can see also his more human and fair side: in several moments around the book, he shows an unusual mercy and flexibility towards the boat crew, even if they misbehaved. Lindholm showed that was not only a brave and clever man, but also a kind one who could understand the feelings of the men around him, but could also hold a firm authority if needed. It is a pity that there are not more graphic memories of Lindhom´s trips. Unfortunately most of his photographs were destroyed in a fire in the year 1905 that affected his library. Nicholas Davis calculates that “Otto Lindholm travelled 17 times around the world. If one considers that one had to travel in the 19th century from Europe to the Pacific and the Far East by way of Cape Horn or the Cape of Good Hope one can easily estimate that he probably travelled over one million kilometres in his life time“. An amazing statistic even nowadays, so imagine with the technical difficulties that any traveller would have to face in the 19th century! The book is pretty recommendable for those of you interested in Finnish history and travelling. Not so many times you have the chance to read such an eloquent narration of adventures all over the world; In fact, I have a warning for animal lovers: maybe you will not enjoy this book. The description of killing whales and many other animals like bears, foxes, etc, are sometimes quite meticulous. But take into account that these men were travelling with no catering service close to them. Hunting for them was in many cases not only a hobby (although in some parts of the book they also go hunting for fun with the aristocracy) but a ways of surviving in a wild environment. Sometimes I just miss that Otto would share more details about his private life and family relations instead of the accountancy of all the dinners and parties he gets invited, but obviously, he was finding more interesting to account about his social developments, keeping (as a good Finn) his role as caring husband and father for himself. Otto Lindholm certainly sought adventure, was daring, headstrong and fortunate, but always with this humanitarianism which finds something honest in every man. He is also someone who knew that a favour would be returned one day, who saw in everyone opposite him a potential friend. Ambitious, Otto certainly wanted to be well known, but he also wanted it for others and his family. He had a natural talent for business but was also someone who could foresee opportunities; he had a foreboding for the precariousness of life, just like an ice-pack which one thinks is secure but might suddenly break up when the wind turns. He also knew that from any hopeless situation one can always survive through hope and human courage”.